Exoskeletons are demonstrably awesome, allowing humans to accomplish feats of strength beyond their normal capacity. The future is bright for the technology — not just for industrial and military applications, but especially in therapy and rehabilitation. Normally, one thinks of adults who have lost function in their limbs, but in the case of this exoskeleton, developed by The Spanish National Research Council (CSIC), children with spinal muscular atrophy are given a chance to lead an active life. Designing prosthetics for children can be difficult since they are constantly growing, and CSIC’s is designed to be telescopic to accommodate patients between the ages 3-14. Five motors in each leg adapt to the individual symptoms of the patient through sensors which detect the child’s intent to move and simulates what would be their natural walking gait. Medical conditions that prevent individuals from being able to walk are difficult to handle, even more so if the patient happens to be a child. Shriner’s hospitals treat a good number of children suffering from cerebral palsy, spina bifida, or amputations. 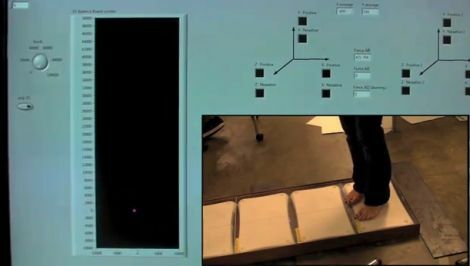 They are always looking for creative treatment methods, so their Motion Analysis Laboratory looked to some Rice University undergrads for help. They asked the group of engineers to design a system that would make physical therapy a bit more fun, while helping encourage the children along. The team recently unveiled their project, called the Equiliberator. The game system incorporates a series of five Wii balance boards situated between a pair of pressure-sensitive handrails. The platform communicates with a computer via Bluetooth, registering the patient’s movements as he or she moves along the path. The software portion of the system consists of a monster-slaying game which requires the child to step on a particular section of the pathway to dispose of the oncoming enemies. The game is designed to get more difficult as the child’s balance and coordination improve, encouraging them with an ever growing bank of points as they progress. The final goal of the project is to enable the pressure sensitive handrails to determine how much the child is relying on them for balance, offering in-game incentives to walk with as little support as possible. We love seeing hacks like this which not only entertain, but truly help people in the process. Kudos to the team at Rice University – they have done a fantastic job here. Continue reading to see a quick video describing the Equiliberator in the designers’ own words.